Based on all of the positive reviews of "A Treasure" thus far, it would seem that Neil Young & The International Harvesters have a bumper crop on their hands. 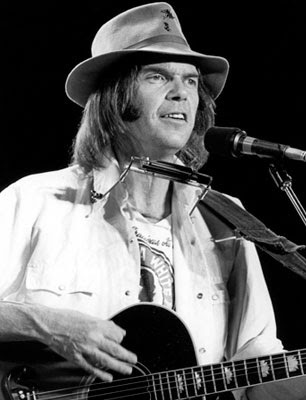 Which brings us to the "The Making of A Treasure" based on recent interviews with Neil Young. Rarely have we ever had so much insight into the creative process of producing a release as we have with these recent interviews and the videos Tech Notes and Neil Young's Photo Gallery Interview on the International Harvesters. When asked what he and Ben Keith, who passed away last year, were looking for in that trove of twang and dirt-road idealism, Young is cheerfully forthright. "We were looking for this," he says. "We were looking for a treasure. And we found it." "I wanted to capture the spirit of this band playing together, the greatness of these musicians," Young continues, calling from Nashville two days after his Bonnaroo show with Buffalo Springfield. "I wanted to capture the interplay of real country music, being played by real country musicians. "I was told that no matter what I did, country radio would not play me," Young recalls, "mostly because of my songwriting. I'd put out things like 'Southern Man' and 'Alabama'" – Young's Seventies broadsides at reactionary Dixie conservatism – "so culturally, they drew the line. "But while we were not accepted by country radio, we were accepted by country musicians," he adds with emphatic relish. "They all played 'Southern Man' with me. They didn't care. It wasn't about that." "I only played songs with the Harvesters that the band could do justice to," Young says of the set lists on those tours. "And a lot of those were pure country songs." "Country and blues is almost the same thing," Young declares. "It's just the way it's played – the musicians, the use of the instruments. To me, the songs all fit. I didn't care." There is a quick chuckle on the line. "I had limited success in both directions, so it didn't matter to me." 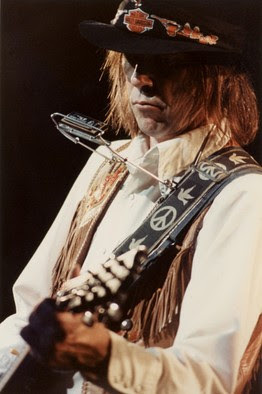 He cites one exception from the Harvesters period, an early '85 tour of Australia and New Zealand: "I toured with half of that band and half of Crazy Horse. And it didn't work that well. I realized I'd lost some of the authenticity, in trying to do too many things at once – exactly what I'd been trying to avoid." When Young hit the road again in the U.S. in the fall of '85, he was back with a full band of Harvesters. "I'd ended up with something that was not as satisfying, so I stayed with the extremes. Whether people understood it or not was secondary." "At that point in my life, the people in control of who played the music on the radio, how it got out, were sure that I shouldn't be doing what I was doing," Young says with a curt lingering irritation. "But it didn't matter to me. I kept on doing it anyway. When you hear this record, that's the reason. Maybe now, 25 years later, it might float. "But the thing is, it doesn't matter if it floats. Because it floats for me and the musicians, for everybody that was a part of it." "Anything that anybody puts out there is fair game for me. I can now use and I will continue to use on all my 'Archives' projects from now on any defining performance from any (source) synced up to the sound that I like." "We wanted to bring as much of the experience, from a historic, archival perspective, as possible. If I can see a band play a song and it's not the same version, I will sync it up and make it work so that you get a feeling of what was actually happening during the day when it was done. Now I have all these videos of things I did a long time ago...that I will sync up with my archival studio tracks and take people on a trip back there, where it was happening. There's something really cool about that." "We had no support. I was being sued by my record company...and I also had been told by (Geffen) that country radio would never play this. So we really started to let out the shaft and just go for it. I was out there doing it myself and playing it for people who were loving it, and we were having a great time living high off the hog and just flying down the road in buses and just never stopped for about a year." 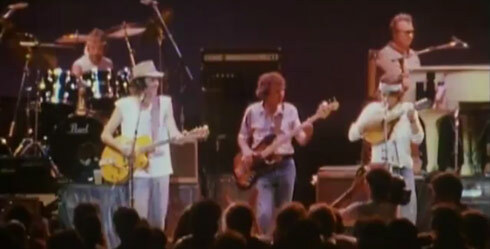 "The band could learn a song in half an hour, and we could play it that night. There's nothing these guys couldn't do. This was a band that could play anything and play it right away, so there was no delay. That was perfect for me. In the future, Young adds: "There'll be some Internet-based distributions that'll be interesting." WSJ: In addition to the lawsuit by Geffen, you also switched booking agents and toured different venues, including state fairs. Did you take a financial hit for your artistic decisions? YOUNG: It was a pretty big financial hit. At the same time I was doing that my financial situation was further clouded by being sued by the IRS for having to go back and pay, retroactively for seven years, sales tax on product that I'd made. According to the IRS, I had so much artistic control in my contract that I was actually selling music to the record company, and that put me in a different tax bracket. So that was quite a monthly hit that I took, along with the fact that I was being sued and along with the fact that radio stations would not play country music by me. There were enough things working in that direction that I just decided to ignore everything. Trying to deal at once I would have gone crazy. So I just stayed on the road, where I could afford to live and make the music that I love. But Young, long celebrated for his iconoclastic artistic spirit, never got to record the album he had in mind at the time. "It was the first time in my life I'd been locked out of the studio by my record company." They thought I was all over the map and didn't understand why I was out there playing country, although to me it sounded like B.B. King more than country. To me it didn't make any difference. They could call it whatever they wanted. But I'd already been making records a long time and I knew what I wanted to do. They could call it whatever they wanted." "They told me they wanted me to play rock 'n' roll, and told me I didn't sound like Neil Young. So I gave them 'Everybody's Rockin' ' and said, 'This is a rock 'n' roll album by Neil Young after someone tells him what to do; this is exactly what you said you wanted.' And we got way into it. I really liked it. As long as it's good music and I'm playing with my friends, I don't care what genre it is. All my music comes from all music — I'm not country, I'm not rock 'n' roll, I'm just me, and all these things are what I like." "Once you do something really well, you really don't want to do it again. The natural thing is to keep on going and find something else to do. The way we did those songs, there's nothing that makes me want to do them again. If I could play them with the same band again I would, but I can't do that. That's what this whole record is about." "The only musical person in the whole organization was the guy who owned it [Label founder David Geffen]. He was going farther and farther down his own path; he was a media mogul and had other things on his mind.... None of the other people there were music people. They would send people out on the road, listen to the [Harvesters] band and go back to the record company and say I was not ready to record. They wouldn't talk to me, then I'd hear they'd been there. They'd make suggestions on what they thought I ought to record. The record company did everything it could to stop me from doing what I did, but I look at is as some of the best work I ever did. Up until that point I'd had a very supportive relationship with them." "Eventually they let me out of the contract. They had to. They sued me, and I still didn't stop." "I wish they were still here today, I would be doing more work with them. But so many important elements of the band are gone. It's like playing 'Harvest' songs without Ben Keith — I just can't go back there...."
Also, see reviews of Neil Young & The International Harvesters "A Treasure" and Tech Notes: Preview Video of Neil Young's New Album "A Treasure". What a man. This is why I love him. It's all about the music. Does anyone know what version of "Down By The River" Neil is referring to??? I remember hearing a 20-minute version on RustRadio from what I think was the 84 Tour, but I don't know the date of the show. :/ It was the most amazing version of the song I've ever heard, bar none. Just mind-blowing!!!! If anyone can help, it would be MUCH appreciated! Always speaks with such a sincerity to the course and shows humility and respect and praise to his fellow musicians...hasn't got an egotistical bone in his body. these are attributes of a beautiful person. I just can't believe in a career spanning some 45 or so years, just how many phases and genres in music he has gone through. Neil, the ever changing chameleon....A TREASURE! !